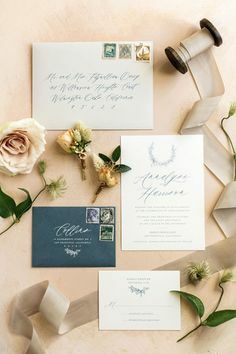 Understanding invitation etiquette and sorting out what wording to use to invite guests to your celebration should NOT be something that keeps you up at night or dominates your Google/Pinterest searches. Save that extra energy for writing the best vows anyone has ever spoken or planning some really killer honeymoon adventures. 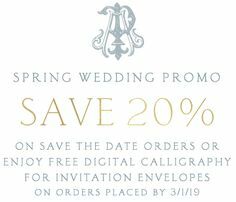 We’re happy to do the heavy lifting when it comes to nailing those nitty gritty wording details, so we created a straightforward, easy to use, and darn good looking (if we do say so ourselves!) infographic to guide you through the process of selecting wording for your wedding invitations. We include a simple breakdown of the key anatomy of a wedding invitation, what to avoid (the big bad registry mention! ), tips and tricks for understanding attire and our fave wording options for different celebration styles. And to make things extra easy? In this post we include 21 different cut-and-pastable wording examples you can copy right from the page and then update with your particulars. 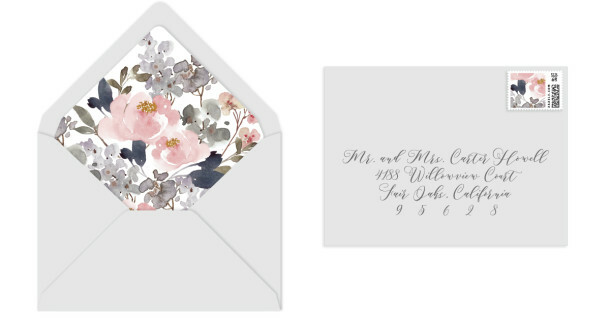 There are 6 key parts to a wedding invitation that stationery etiquette have some guidelines for. We are big fans of knowing the rules and then breaking them when it suits you. 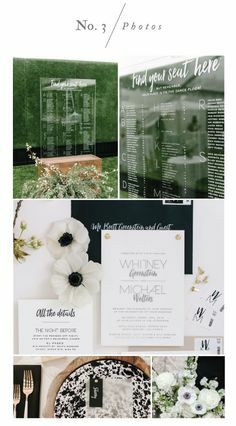 Truly, your invitations should be a reflection of your celebration, whether that is traditional and formal or playful and casual. Our job is to help you understand what to include and how, yours is to decide what works for you! For more, you can also scroll down to our copy-and-pastable wording examples to grab the text that fits you best. There are variations on both options, such as “Your joyful presence is requested at the marriage celebration of…” for less formal celebrations or “The honour of your presence is requested at the Nuptial Mass uniting…” for Catholic ceremonies. For ceremonies held in a house of worship, spelling honour with a “u” is also acceptable and generally considered an extra layer of formality. Check out our full list of wording variations below for more! The bride comes first, always. Until she is married, the bride is listed first on all paper. If the groom’s parents are also listed in the host section, both the bride’s and groom’s last names may be omitted. It is equally correct to leave them in and is really at your discretion. It is also optional to add a line right after the groom’s name to honor his parents. This is called a “Son of” line and reads like this: Son of Mr. and Mrs. Fitzwilliam Darcy. Date: Always write out the date in full and list the day of the week first, this is especially helpful if you are having a Friday or Sunday celebration! Like this: Saturday, the fifteenth of June. Year: If you are including the year, write it out in full. It is equally correct to write it with and without the “and” (two thousand sixteen // two thousand and sixteen). Traditional wedding etiquette also recommends capitalizing the T at the start of the year. The rest should remain lowercase. Time of Day: Finally, 4pm is considered afternoon, but 5pm and later is considered evening. 5) Location | Unless your celebration is being held at a private home or at a location with an unlisted address, typically the street address is not included in this section and only the city and state are noted, both spelled out in full without abbreviation. If you are marrying at a church and there is another church in the same town with a similar name, that would be another instance where the street address would be included to ensure guests navigate to the correct venue. Black Tie: This is for the most formal of weddings. Black tie indicates tuxedo with bowtie and cummerbund or vest for men, and a long, formal gown in muted hues for ladies. Black Tie Preferred or Formal Attire: These options can be used interchangeably to mean that men may wear a formal tuxedo or a dark suit with a tie. Ladies may wear a long gown or a shorter, but still formal, cocktail dress, usually in darker neutral hues (skip the fun hot pink frock for this one!). Semi-Formal Attire: This is the phrasing that confuses most couples! Semi-formal means a suit with a tie for men, fancy cocktail dress for ladies. A suit jacket should still be worn, but the dark color rule isn’t as crucial, if it is a daytime or summer wedding, a lighter tan suit is acceptable. Cocktail Attire: Cocktail attire means suit coat is encouraged, but optional, and a tie is still requested for men; cocktail dress, usually not a long one, is expected for the ladies. Resort Casual or Beach Chic: You will most often see these attire options for destination weddings or for celebrations taking place beachside. For men, think collared or linen shirts with slacks for men (no tie needed), and fun summer dress with flat sandals for ladies. Garden Party Attire: Garden party attire typically indicates a light-colored, summer suit for men (tie optional) and a short summer dress for ladies. 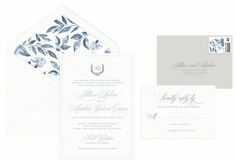 There are a few extra tips and tricks we like to keep in mind when selecting wedding invitation wording with our couples. 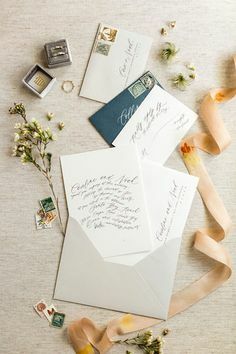 Stationery etiquette has a few traditional rules and guidelines that we think are important to consider, to avoid making any significant faux pas when inviting guests to your celebration. 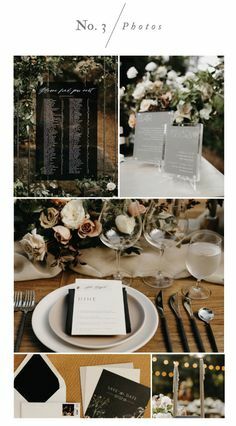 Instead, we recommend including registry details on a wedding website and noting the website on a card in your invitation suite (a mini website tag is our favorite place), or informing close family members of your registry, so they can pass this information along to inquiring family members and friends through word of mouth. Postage: There is nothing worse than sending 100 beautifully calligraphed envelopes, only to have them returned to you for insufficient postage. While the number of stamps you need may seem straightforward, keep in mind, extra thick or heavy invitation sets, or suites with a seal, bow or other addition creating a “bump” will require additional postage, often at the discretion of the postal worker handling your suite. 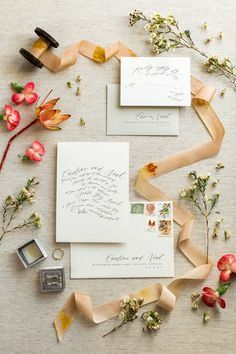 The “rigidity” of an invitation is a subjective determination so be sure to check in with the post office you will be mailing from and have them weight and test an actual set you will be sending to make sure you are covered when it comes to the postage amount. Hand Canceling: Usually reserved for non-machinable items (letters that are too thick to make it through the postage canceling machine), hand canceling is the process by which a postal worker stamps your envelopes by hand to zero out the postage before they are sorted. 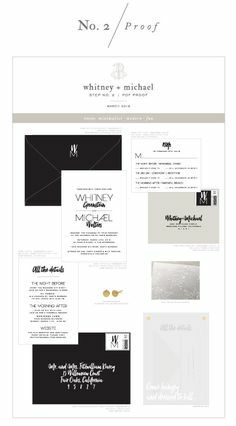 This service usually requires an additional $.21 for postage, but is the best way to make sure your invitations make it to guests looking their best. Unfortunately, not all post offices will do this for you. Some will accept the envelopes with a note and send them to the district/regional postal facility to be hand stamped, others will refuse altogether. Usually, smaller suburban post offices where workers are less stressed are your best bet for having them cancelled on site or even, for the lucky few, while you wait. 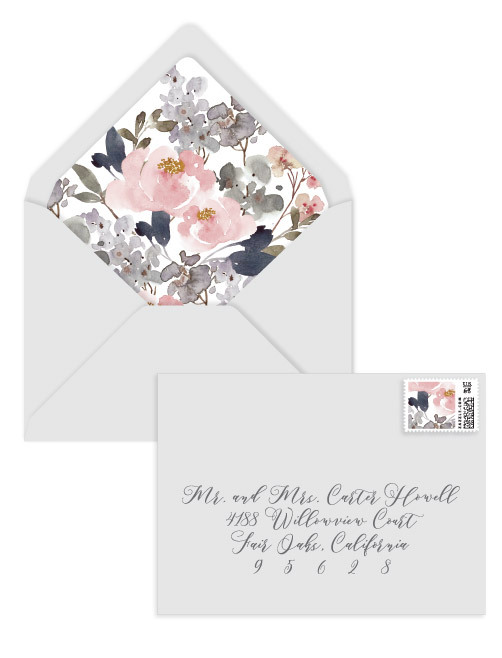 We always recommend letting postal employees know that you are sending wedding invitations before asking, it’s a little harder for them to say no – a little love goes a long way!